3M Scott Safety Airline Breathing Apparatus is the perfect solution for applications across many industries. Internationally renowned for reliability, ease of use, durability and comfort. Airline breathing apparatus is the perfect solution for applications across many industries. However, the selection of the equipment has traditionally been seen as a complicated process - due to the high number of options available. 3M Scott Safety has over 65 years experience in the manufacture of breathing apparatus, providing unrivalled technical support and advice. With the widest choice of airline breathing solutions, the Company's Sabre range is internationally renowned for reliability, ease of use, durability and comfort. Ideal for environments where ambient oxygen cannot be guaranteed, airline breathing apparatus combines the highest degree of respiratory protection with long duration use. Fed by a medium pressure air hose, it is used for industrial applications as diverse as entering sewers, cleaning out tanks and spray painting military aircraft. The advantages are clear: there is no weight, no bulk and - in theory - an infinite amount of air. Completely modular, 3M Scott Safety airline components afford almost unlimited flexibility, allowing the user to individually specify a system that exactly meets their operational needs. Multiple configurations can be selected from a standalone portable product - for use where no other supply of compressed air is available - to products that integrate into existing compressor-fed airline infrastructure. The Modulair is a compact, easy to use airline trolley system designed to provide portable clean air in restricted access areas. 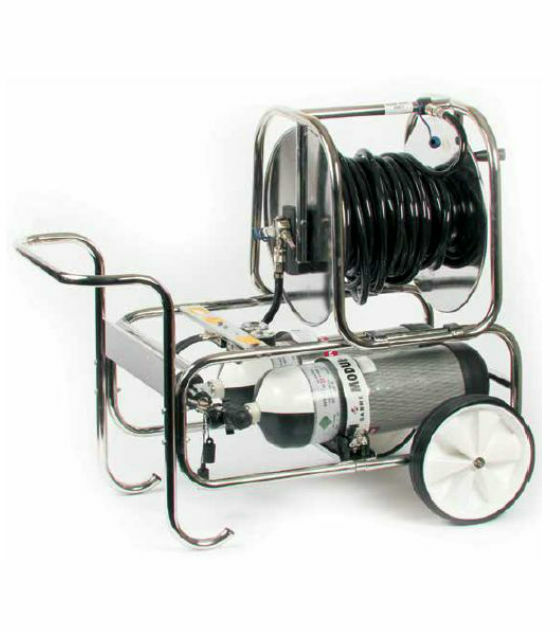 Versatile and robust, it consists of a lightweight stainless steel hose reel unit and cylinder frame that can be used independently or together. The frame is designed to carry a pair of cylinders and, where required, an additional frame can be vertically stacked to allow connection of up to four cylinders. This, in conjunction with proven 300 bar high performance pneumatics delivering up to 1000 litres of breathing air per minute, permits four people to work at the same time. Long duration operation is made simple through adjustable cylinder bands and high pressure cylinder connectors to accommodate a variety of cylinder sizes at both 200 and 300 bar. Non-return bleed valves fitted to the cylinder connectors enable cylinders to be replaced independently for continuous operation. To safeguard against any drop in air supply pressure the Modulair can be fitted with a medium pressure warning whistle or a DS4 (automatic distress signal unit) for both audible and visual alarms if the airline supply pressure falls below 3.8-4.1 bar (55-60 psi). In either case, the operation of the alarm informs safety rescue personnel to switch over to the reserve air supply, change cylinders or initiate evacuation procedures as appropriate. Flite, in its simplest form, provides the user with breathing air from a medium pressure airline. It consists of a lightweight, easy to don bandolier harness with padded shoulder strap, a pigtail connection with safety locking coupling, a Tempest positive pressure demand valve with first breath activation and hands-free bypass facility. As the equipment is positive pressure, it provides the user with the highest possible protection factor allowing Flite to be used in IDLH and oxygen deficient environments. Flite apparatus can be used with any of the Sabre range of positive pressure facemasks: Vision 3, or Promask Postive Pressure. With airline breathing apparatus the user's safety is dependent upon outside influences - the airline supply could become disrupted. Flite includes the option of an escape cylinder that can be added to the unit at any time, this serves as an important additional safety benefit to safeguard against a failure of the airline supply. Flite Escape is widely used by people working in confined spaces or hazardous environments, such as the oil and gas industry, where levels of H2S can be extremely high. 10 and 15 minute steel cylinders or a 13 minute superlight carbon composite cylinder are available. The Respiratory Airline System (RAS) is a novel solution to situations where the user must enter and egress from working environments where the hazardous atmospheres are known and the infrastructure of the airline network are semi permanent. The RAS is a positive pressure system consisting of a Flite apparatus coupled with a facemask that has both positive pressure and DIN 40mm thread filter connections. This solution increases freedom of movement by enabling the user to enter and egress from the working environment using a filter where there is no danger of there being an oxygen deficient atmosphere. Then, when in a working situation where the level of contaminants will be highest, connect into an airline system and work under positive pressure. RAS versions of the Promask Positive Pressure and Vision 3 facemasks are available. The RAS Asbestos is an industry specific product based upon the standard RAS system. Used in exactly the same way, the RAS Asbestos has the added benefit of an in-line filter in the medium pressure supply hose. This filter removes particulates down to 0.01 microns and protects the wearer from any asbestos particles that may be have entered into the pigtail during the entry and connection to the airline procedure. The unique coated wipeclean webbing bandolier aids with decontamination after use.